What is meant by a spiritually blessed schedule? 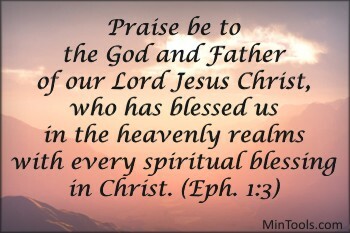 “blessed us in the heavenly realms with every spiritual blessing in Christ” (Eph. 1:3). Let’s break this verse down to better understand what a spiritually blessed schedule would be. … schedules that are guided by perspective that comes from understanding our position in Him giving us the ability to prioritize that which is eternally relevant not that which merely yields earthly, temporal gratification. What difference do spiritually blessed schedules make? To answer that question, we need to look at some of the specific ways we have been blessed in Christ and reflect on how that affects what we do with our time. Following are four blessings listed in the first chapter of Ephesians. 1) We are declared holy and blameless in God’s sight because of Jesus, not because of what we’ve done. As those chosen “in him before the creation of the world to be holy and blameless in his sight” (Eph. 1:4), our schedules aren’t driven by a need for performance. Rather, we find our identity in Him, in how He views us, which frees us to “be” who we should be. We will not be consumed simply by how much we accomplish in a day. Displaying Christ-like character and a Christ-centered process will matter. 2) We are adopted into God’s family because of and through Jesus. Because of our “adoption to sonship through Jesus Christ” (Eph. 1:5), our schedules become concerned with our Father’s business from whom we receive our glorious inheritance (Eph. 1:14, 18). We are not living for ourselves but rather for Him as part of His family. 3) We are recipients of God’s grace through Jesus, having been bought back with the price of His blood and forgiven of our sins. Having “redemption through his blood, the forgiveness of sins, in accordance with the riches of God’s grace that he lavished on us” (Eph. 1:7-8a), what we do will reflect the new, abundant, and victorious life we have in Him, not that which caters to our old sin nature. We filter what we do and don’t do through the high standard of His grace. 4) We have been given the Holy Spirit as a sign of God’s work in our lives through Jesus. Since we’ve been marked “with a seal, the promised Holy Spirit, who is a deposit guaranteeing our inheritance until the redemption of those who are God’s possession – to the praise of his glory” (Eph. 1:13-14), we will yield control to the Spirit (Eph. 5:18) in all we do since He has such an integral role in securing who we are in Christ Jesus. This small sampling of blessings we have in Christ should suffice to show us the difference spiritually blessed schedules can make so that we “might be for the praise of his glory” (Eph. 1:11-12). Let’s live in accordance with the Truth of who we are in Him and not be controlled by our feelings, circumstances, or the demands of others. Church leaders, is your schedule spiritually blessed? If so, you will have the perspective you need to do what you should do. You will see the bigger picture when viewing it from your position “in the heavenly realms in Christ Jesus” (Eph. 2:6). Next → Next post: Staff Evaluations: Tied in to the Gospel?